Row 1: dc in 4th ch from hook, 3 dc in same ch, ch 8, skip next 8 ch, sc in next 5 ch, ch 8, skip next 8 ch, dc in next 4 ch, ch 8, skip next 8 ch, sc in next 5 ch, ch 8, skip next 8 ch, dc in next 4 ch,* ch 2. Skip 2 ch , dc in next ch, * repeat from* to* 4 times to last ch. Row 2: Turn, ch 5(ch 5 counts as 1st dc and 2 ch threw out design), dc in next dc, ch 2, dc in next dc, ch 2, dc in next dc, ch 2, dc in next dc , 2 dc in ch-2 space, dc in next dc, ch 3 ,* dc in last dc of dc-4, 3 dc in ch-8 space, ch 7, skip first sc and sc in next 3 sc, ch 7, 3dc in next ch-8 space, dc in next dc, ch 3 * Repeat one more time from * to*, dc in next dc, 3 dc in ch-3 space. Row 3: Turn, Ch 4, 4 dc in top of 1st dc, *ch 3, trc in ch-3 space, ch 3, dc in last dc of 4-dc,3 dc in ch-7 space, ch 5, skip 1st sc, sc in next sc, ch 5, 3 dc in ch-7 space, dc in first of 4-dc, * repeat from * to * ch 3, trc in ch-3 space, ch 3, dc in last dc of 4-dc, 2dc in ch-2 space, dc in next dc, ch 2, dc in next dc, ch 2, dc in next dc, ch 2, dc in 3rd ch in ch-5. Row 4: Turn, Ch 5, dc in next dc, ch 2, dc in next dc, 2 dc in ch-2 space, dc in next dc, *ch 6, sc in ch-3 space, sc in trc, sc in next ch-3 space, ch 6, dc in last dc of 4-dc, 3dc in next ch-5 space, ch 2, trc in sc, ch 2, 3 dc in next ch-5 space, dc in first dc of 4-dc, repeatfrom * one time, ch 6, sc in ch-3 space, sc in trc, scc in next ch-3 space, ch 6, 4 dc in ch-3 space. Row 5: Turn, Ch 4, 4 dc in top of 1st dc, * ch 8, sc in ch-6 space, sc in next 3 sc, sc in next ch-6 space, ch 8, ** 2 dc in ch-2 space, 2 dc in next ch-2 space, * Repeat once from * to * repeat again from * to **, dc in last dc of 4-dc, 2 dc in ch-2 space, dc in next dc, ch2, dc in 3rd ch in ch-5. Row 6: Turn, Ch 5, dc in top of 1st dc, ch 2, skip next 2 dc, dc in next dc * 3 dc in ch-8 space, ch 6, skip sc, sc in next 3 sc, ch 6 , 3 dc in ch-8 space, dc in top of next dc, ch 3, dc in last of 4-dc* Repeat 2 more times. Ch 3. Row 7: Turn * 1 dc in top of 4th dc of 4-dc, 3 dc in ch-6 space, ch 5, skip sc, sc in next sc ,ch 5, 3 dc in ch-6 space, 1 dc in next dc,**ch 3, 1 trc in sc , ch 3,* Repeat from * to * 1 more time, then repeat from * to ** ch 2, dc in last dc of 4-dc , ch 2, dc in top next dc, ch 2, dc in 3rd ch of ch-5. Row 8: Turn, ch 5, dc in top of next dc , ch 2, dc in next dc, ch 2, dc in next dc of 4 dc, ch2,skip next 2 dc, dc in next dc of 4-dc,* 3 dc in ch-5 space, Ch 2, 1 trc in sc, ch 2, 3 dc in ch-5 space,1 dc in next dc, ** ch 6, sc in ch-3 space, 1 sc in trc, 1 sc in ch-3 space, ch 6, dc in last dc of 4-dc*, Repeat from *to* once . Repeat from * to **. Row 9: Turn, ch 3, *2 dc in ch-2 space, 2dc in next ch-2 space, ch 8, 1 sc in ch-6 space, 3sc in next sc, sc in next ch-6 space, ch 8* Repeat from * to * one more time, 2 dc in ch-2 space, 2dc in next ch-2 space, ch 2,skip 2 dc, dc in next dc of 4-dc, ch2, dc in next dc 3times, ch 2, dc in 3rd ch in ch-5. Repeat starting with Row2: through Row 9: until it is long enough. Shrinkage is usually 1 inch for every 20 inches. So make it an inch longer for every 20 inches of finished product. If making a pillow case, connect on row 8 to the other end. 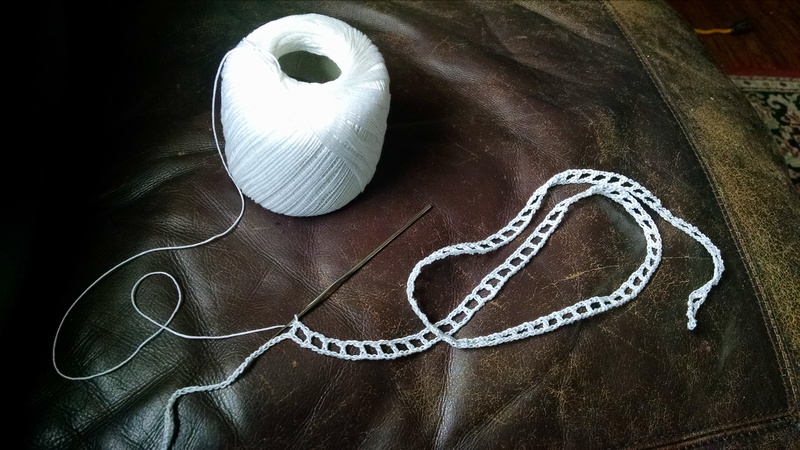 I used a 60 wt thread and # 12 crochet needle. 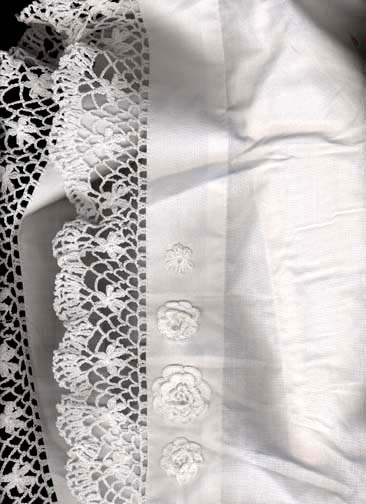 Lace edgings don’t have to be complicated to be elegant. I have a collection of patterns I try out every so often. No lace ever goes to waste. 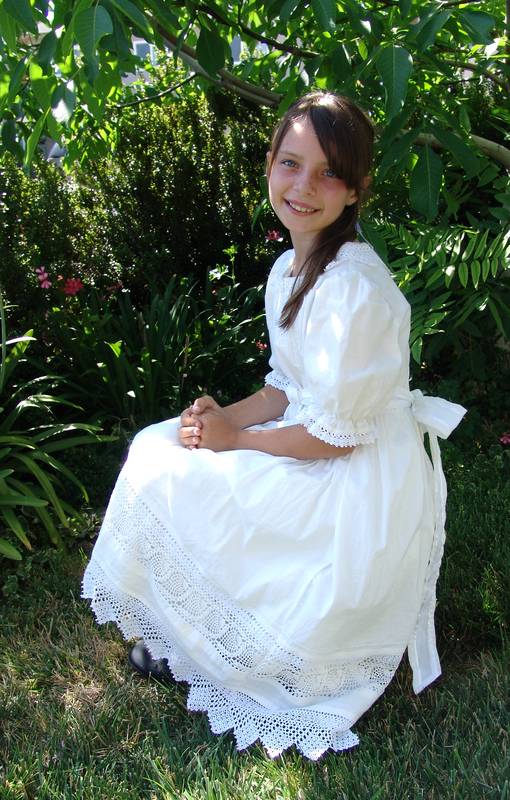 This one ended up on a blessing dress. Simple pattern, beautiful. 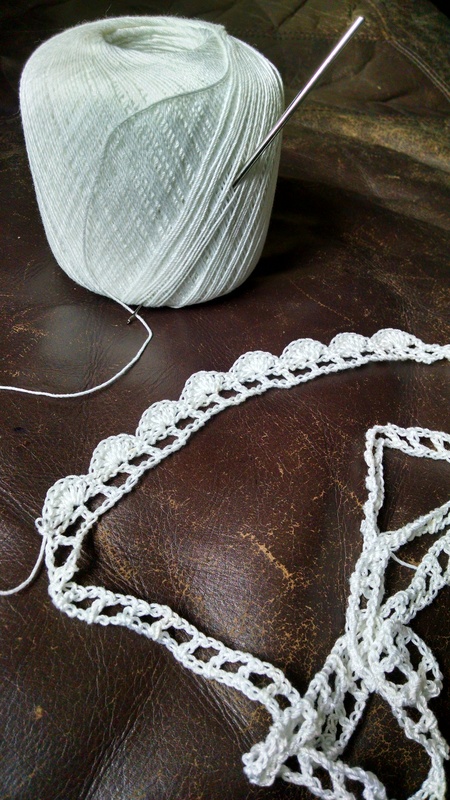 This is my first piece of Irish crochet lace. 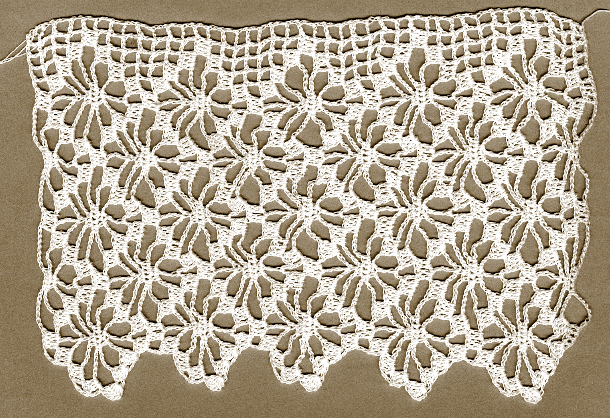 Irish lace is more free form than rigid in pattern. I had no idea when I started how fun it would be. It’s also a little intimidating, because there are no instructions except in pieces. The Irish people made their motifs from the things they saw around them from their windows and cottage yards and hills. Leaves, thistles, roses, clover, briars. 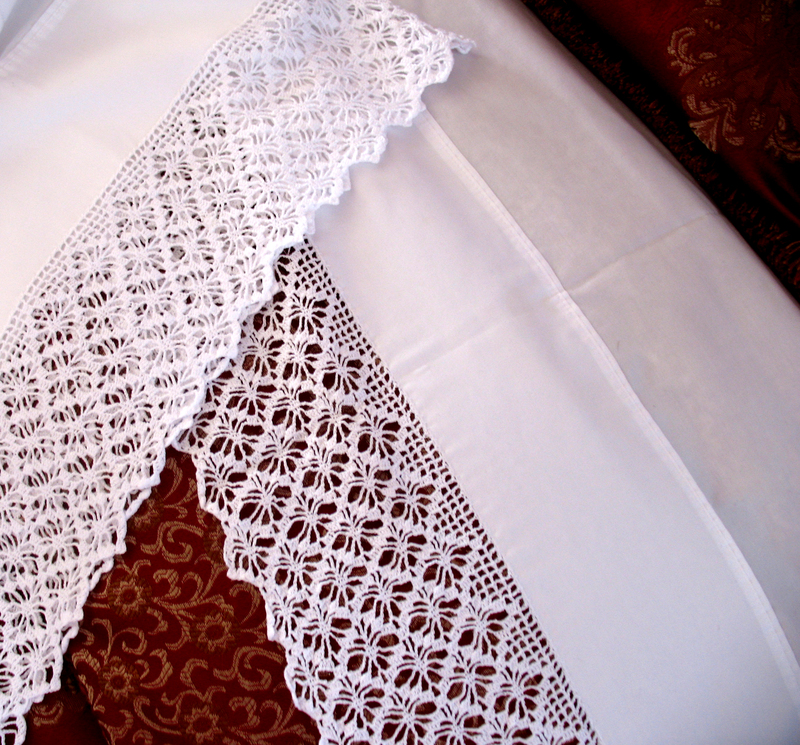 The various motifs, thrown together and wrapped in picot lace, ARE Ireland. 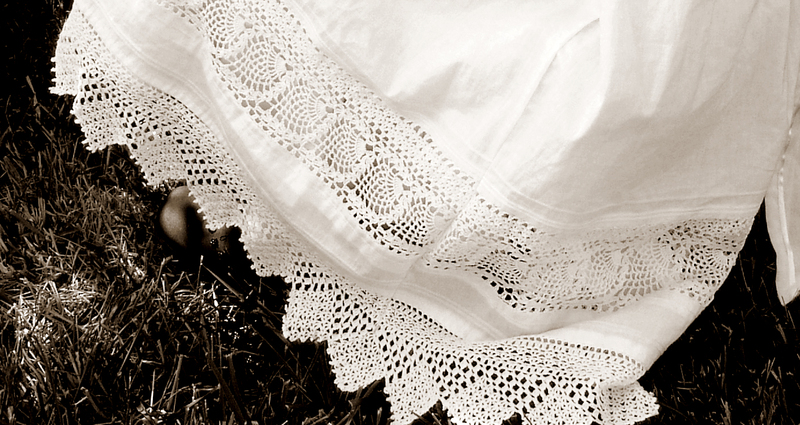 Many of my ancestors were Irish, so I’ve always had a fascination with Irish lace. I was determined to give this one a try. 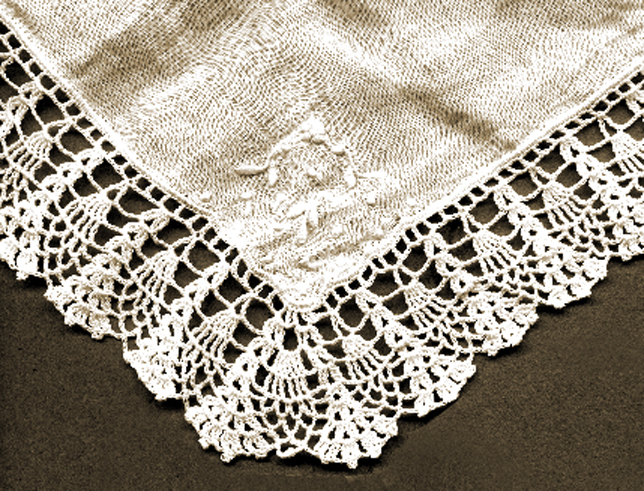 The middle of the lace was made in pieces, with roses and a center, and then each motif was enveloped in stitching afterward. 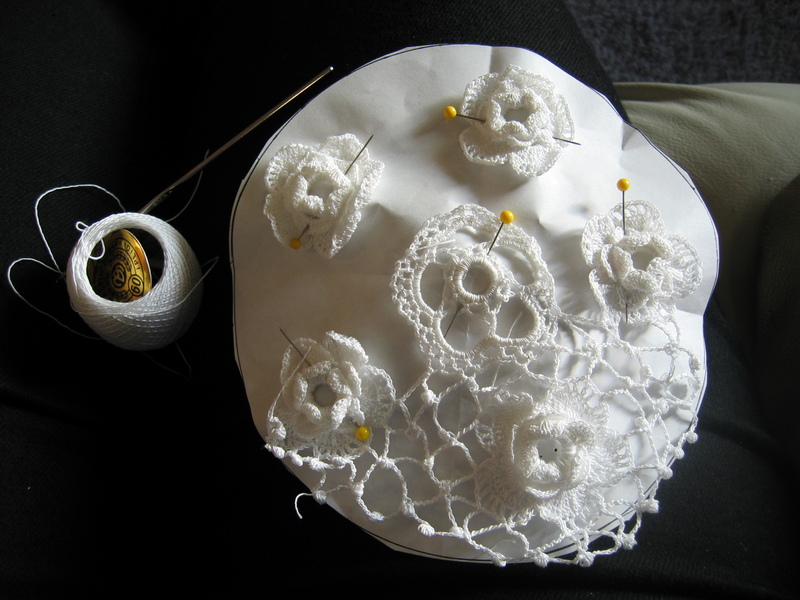 Each flower was made first, and pinned to a section of paper in the shape of the finished lace. 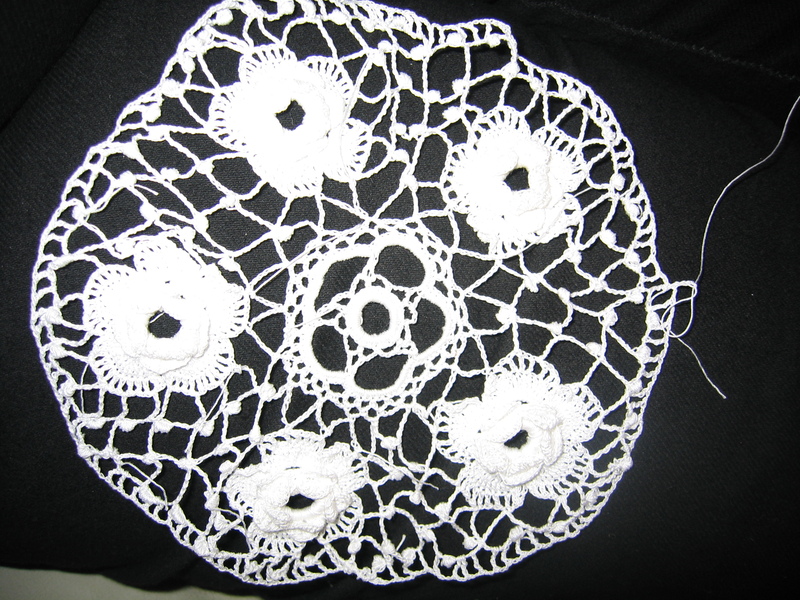 Filler stitches are then attached with picots and mesh to fill in all the areas between the roses until the circle form is complete. 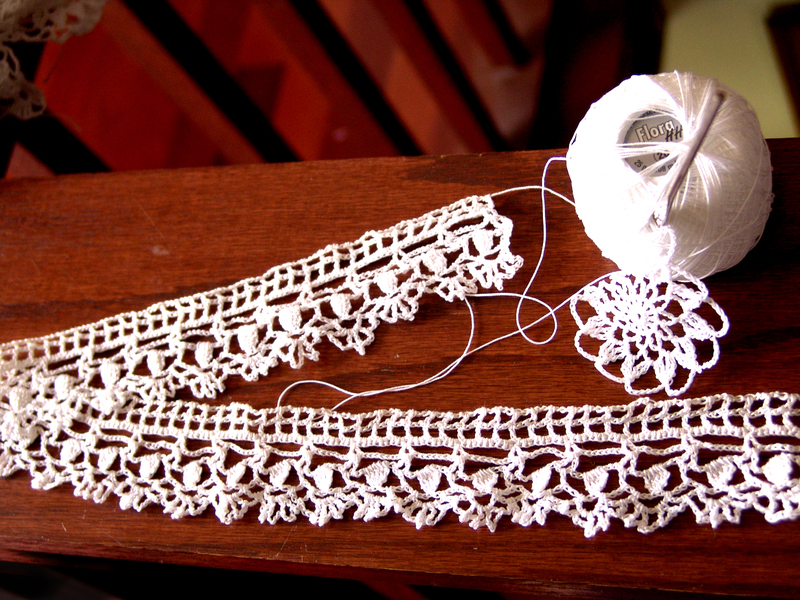 There are several traditional borders that can be added to a lacy center to fill out the piece. This was a great project to learn on. 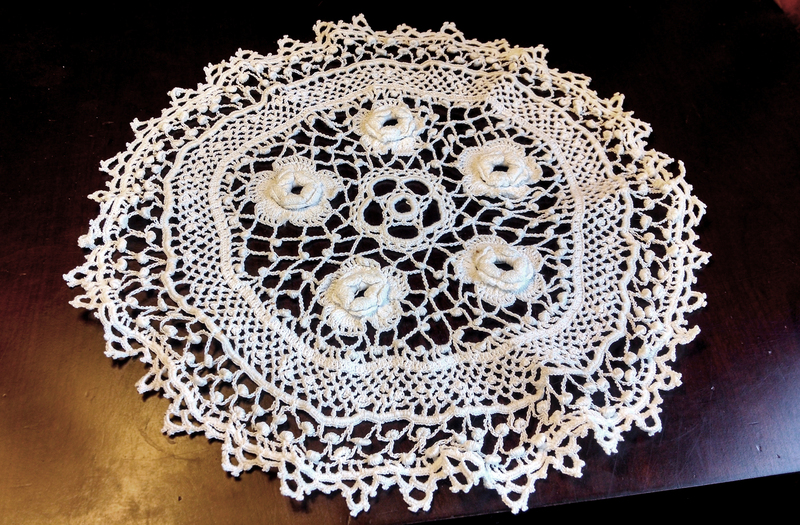 I love Irish roses, and have used several types of roses and other Irish motifs in other projects, but this was my first complete Irish crochet lace. 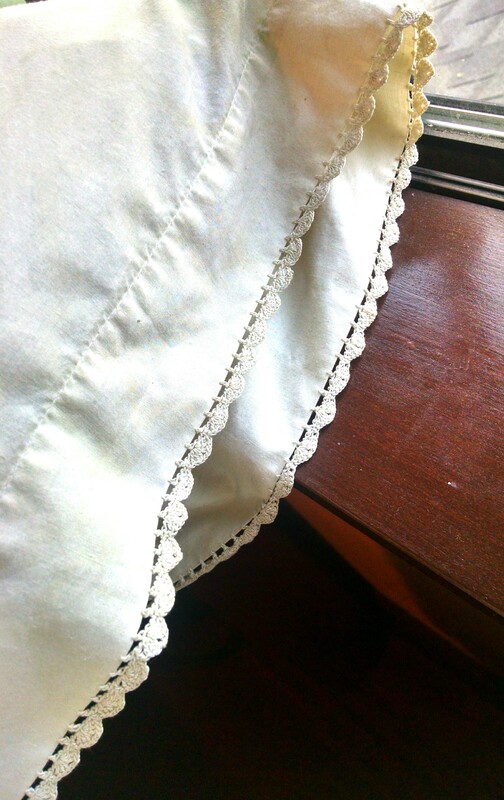 For my daughter’s birthday I made this lace pillow edge with roses. It was a pretty simple project, and she treasures it. When you are getting used to smaller thread, a simple project like this is good practice, and worth the time for a daughter or granddaughter who will treasure the result.